I grew up and went to school in High Wycombe, a leafy, furniture making town in the Chilterns. This was followed by a BSc in Physics and PhD in Biophysics (1987) at Imperial College (IC). I then held a joint postdoc funded by the Wellcome Trust between IC and the Royal London Hospital during which I constructed a visual psychophysics lab in a small room off the Neurology Ward and also occasionally visited the museum to see the skeleton of the "Elephant Man". My research at this time was on Visual Dysfunction and my most interesting subject was a person with Visual Agnosia who you can see in this YouTube video. As a result of this study I became interested in modelling visual dysfunction and with a travel grant from the Royal Society I went to Bell Labs (1990) to learn about artificial Neural Networks. Here I became involved in the work of the Adaptive Systems Research Department on recognizing characters - handwritten or machine printed, on paper or a tablet. Initially this was applied to automating mail sorting for the US post office, but later the technology was (and is) used by banks around the world. This was one of the first demonstrations that neural networks could be applied to "real-world" applications. I also developed some expertise in signature verification using Time Delay Neural Networks. When AT&T broke up (for the 2nd time) I then worked in Project Management (I always gravitated to organising things) on a variety of telecoms projects. When my son started school I returned to the UK and taught in schools for a few years, but I restarted my research career by joining the Open University as a Visiting Research Fellow in 2005. Initially I worked on Robotics Activities for children, editing the English Language version of Roberta learning material, running Robotics Clubs and entering competitions - one team even won the UK RoboCup Junior and competed in the world finals in Suzhou, China (2008). More recently I have worked as a researcher on EU funded projects. Firstly with the ASSYST, a Coordination Action for Complex Systems, and now on agINFRA. Global systems Dynamics and Policy, GSDP. Étoile, EU FET Coordination Action "Enhanced Technologies for Open Intelligent Learning Environments". Project: agINFRA: a data infrastructure to support agricultural scientific communities - promoting data sharing and development of trust in agricultural sciences. EU FP7, Capacities – Research Infrastructures. The total budget is €4 million, with the OU share being £222,745. The last 2 were collaborative projects with NCR. My unique contribution, apart from training software that ran like the Disney version of the Sorcerer's Apprentice and couldn't be stopped, was introducing training on “rubbish” to improve rejection performance. The application of psychophysics (the investigation of the relations between physical stimuli and sensation) to the understanding of the normal mechanisms of visual processing, but also to the study of visual abnormalities in order to offer practical assistance to clinical patients. 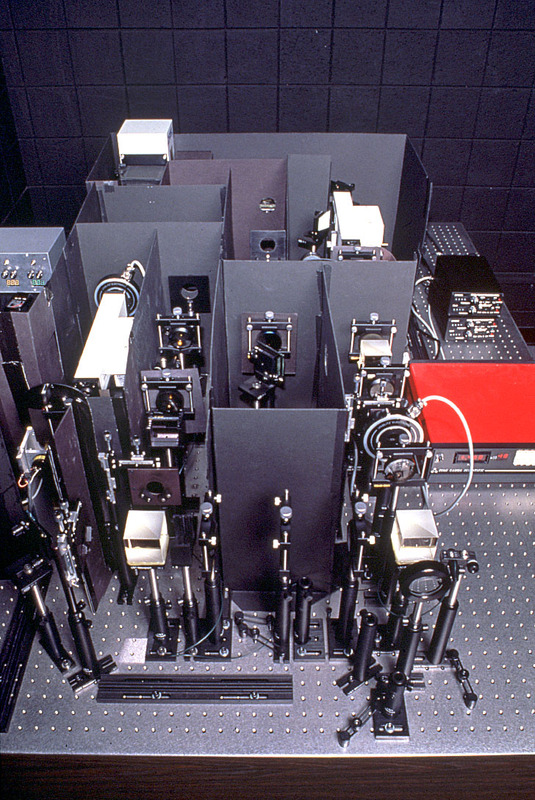 This was experimental work using computer monitors, Maxwellian View Optical Systems , essentially an optical bench with mirrors, lenses, filters and light sources (picture) and the wonderful W. D. Wright Trichromatic Colorimeter built in the 1920s. 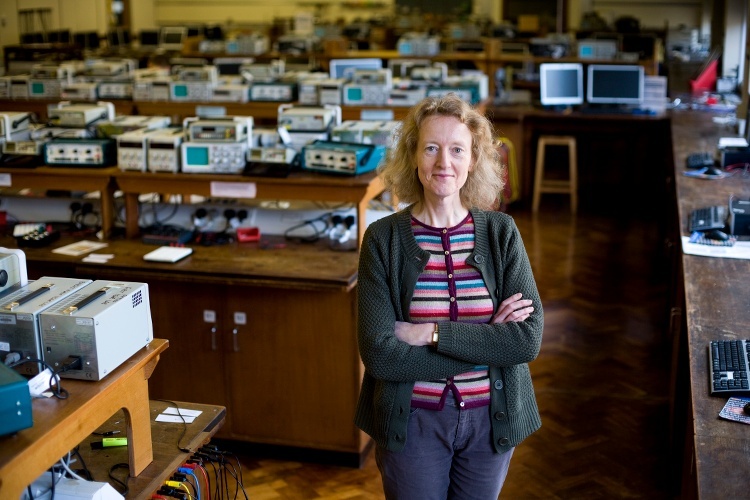 My first experience of teaching was over 20 years ago in the physics labs (picture below) at Imperial College. Following this I also tutored maths (KS2 and GCSE). And now at Engineering Residential School T176 Engineering: professions, practice and skills and as a tutor on T192 Engineering: origins, methods, context. I also jointly supervise a number of PhD students in the Centre for Complexity and Design. They were all excellent - the content was thought provoking - and I would recommend any of them, but the only one still available to study is "The story of maths". Bromley, Jane and Denker, John S.
Säckinger, Eduard; Boser, Bernhard E.; Bromley, Jane M.; LeCun, Yann and Jackel, Larry D.
Boser, Bernhard E.; Sackinger, Eduard; Bromley, Jane; leCun, Yann and Jackel, Lawrence D.
Matan, Ofer; Baird, Henry S.; Bromley, Jane M.; Burges, Christopher J. C.; Denker, John S.; Jackel, Lawrence D.; Le Cun, Yann; Pednault, Edwin P. D.; Satterfield, William D.; Stenard, Charles E. and Thompson, Timothy J.
Alkhateeb, W.; Bromley, J. M.; Humphreys, G. W.; Javadnia, A.; Riddoch, M. J. and Ruddock, K. H.
Boser, Bernhard E.; Säckinger, Eduard; Bromley, Jane M.; Le Cun, Yann and Jackel, Lawrence D.
Bromley, J. M.; Javadnia, A. and Ruddock, K. H.
Blythe, Isobel M.; Bromley, Jane M.; Kennard, C. and Ruddock, K. H.
Blythe, I. M.; Bromley, J. M.; Ruddock, K. H.; Kennard, C. and Traub, M.
Blythe, Isobel M.; Bromley, Jane M.; Holliday, I. E. and Ruddock, K. H.
Guyon, I.; Bromley, J. M.; Matić, N.; Schenkel, M. and Weissman, H.
Jackel, L. D.; Battista, M. Y.; Ben, J.; Bromley, J.; Burges, C. J. C.; Baird, H. S.; Cosatto, E.; Denker, J. S.; Graf, H. P.; Katseff, H. P.; Le Cun, Y.; Nohl, C. R.; Sackinger, E.; Shamilian, J. H.; Shoemaker, T.; Stenard, C. E.; Strom, B. I.; Ting, R.; Wood, T. and Zuraw, C. R.
Alkhateeb, W.; Bromley, J. M.; Ibbotsen, V.; Javadnia, A.; Ruddock, K. H. and Terry, A.
Bromley, Jane M.; King, David and Morse, David R.
Boser, Bernhard E.; Säckinger, Eduard; Bromley, Jane; LeCun, Yann; Howard, Richard E. and Jackel, Lawrence D.
Jackel, L. D.; Stenard, C. E.; Baird, H. S.; Boser, B.; Bromley, J.; Burges, C. J. C.; Denker, J. S.; Graf, H. P.; Henderson, D.; Howard, R. E.; Hubbard, W.; leCun, Y.; Matan, O.; Pednault, E.; Satterfield, W.; Säckinger, E. and Thompson, T.
Alkhateeb, Wafa; Bromley, Jane; Javadia, Atafeh and Ruddock, K. H.
Bromley, J. M.; Humphreys, G. W.; Javadnia, A.; Riddoch, M. J. and Ruddock, K. H.
Blythe, I. M.; Bromley, J. M.; Kennard, C. and Ruddock, K. H.
Bromley, J. and Sackinger, E.